a community of Jesus followers that seeks to live out our baptismal calling we have from God to “proclaim Christ through word and deed, care for others and the world God made, and work for justice and peace”. (From our liturgy for Holy Baptism). We’re a community of sinner-saints utterly dependent on the undeserved love of God! The Lutheran church calls this “grace.” We believe that God always comes down to us, initiating the relationship we have with God. We believe we are saved only by the grace of God, not by our works. God’s amazing love stirs us to be the hands and feet of Jesus in a world that so desperately needs acts of service and compassion. We believe these things because of what we read in the Bible – the “cradle wherein Christ is laid,” as Martin Luther reminds us. We confess our faith in the words of the Apostles’ and Nicene Creeds and are reminded weekly of God the Father as Creator, God the Son as Redeemer, and God the Holy Spirit as Animator who makes us holy. We celebrate and receive with joy the two sacraments of Holy Baptism and The Lord’s Supper. 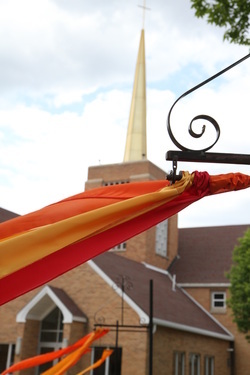 Christ Lutheran Church is one of the 247 congregations of the Southwestern Minnesota Synod, and a part of the Evangelical Lutheran Church in America, (ELCA). Across the United States, Puerto Rico and the U.S. Virgin Islands, there are 65 synods in the ELCA. Together with all these brothers and sisters in faith, we are linked in a way to accompany the work of our 26 ELCA Lutheran colleges and 8 seminaries.